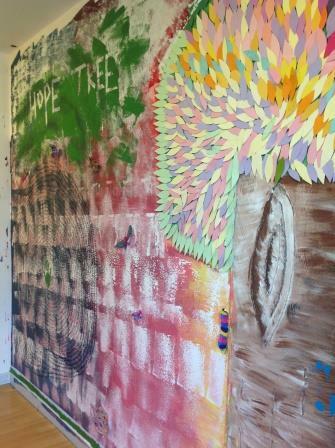 Langley Green mental health hospital in Crawley has unveiled a mural created by patients, symbolising hope and recovery. The idea for the ‘Hope Tree’ came from a patient on Jade Ward at Langley Green Hospital, which is run by Sussex Partnership NHS Foundation Trust. The therapeutic benefit of art is widely recognised and is often used as part of treatment for those living with both mental and physical health conditions, as well as for supporting general wellbeing. The team at Langley Green believe in the importance of listening to patients’ ideas about what they think will help them in their own recovery. Ward staff supported the patient to develop the mural, which can be seen in the visitors seating area next to the ward entrance. Using bright colours and differing textures, the mural is a sensory experience for the viewer. Featuring hand prints, three dimensional butterflies and inspirational words the mural is captivating and thought provoking. From initial idea to unveiling the mural took four weeks, completed almost single-handedly by one patient, with some additional support from art groups running on the ward. Rosie Drage, Ward Manager of Jade Ward at Langley Green said: “The Hope Tree shows that if you have an idea, you can make it a reality. The tree symbolises the importance of having hope and motivation and has allowed us to empower a service user to make this happen. One of the unique features of the mural is the individual paper leaves on the tree which are removeable. People can write what hope means to them on the leaf and add it back to the tree. The vision is that the tree will develop and be added to over the coming months and years, to truly capture the sense of hope within the ward.